With the news that General Electric is leaving Fairfield for Boston fresh in the mind of lawmakers, 2016 can be a year of opportunity for Connecticut. It can be, that is, if lawmakers make it one. We can argue over blame, but that would be a distraction. We can give up, but that would be a shame. But if we accept that policy needs an altered direction we can build on our state’s strengths, prevent future losses like GE and bring new opportunities to Connecticut. How do we know we need a change? Eight-hundred top executives and their employer, one of the 10 largest companies in the U.S., just sat us down for an intervention. Connecticut has a problem, a tax problem. Unfortunately it took the departure of one of the Connecticut’s preeminent employers to the state formerly known as Taxachusetts for this to register. And even now, some are in denial. Perhaps part of the confusion is that taxes aren’t the only problem. Connecticut has other disadvantages, too. Florida is warmer and Massachusetts has Boston, Harvard and MIT. There is nothing the legislature can do about those disadvantages. These disadvantages are not new, either. Boston hasn’t moved and Florida has always been hot. What has changed? Taxpayers in our state have faced the two largest tax increases in our state’s history in just five years. Twenty-five years ago, with the implementation of the income tax, we started trading away our competitive advantage on taxes. The tactic of lawmakers dialing up our state taxes a little bit at a time, while trying to pretend we’re still a little bit lower than our neighbors, has run its course. We need to try something new. For example, let’s not increase taxes again. Two days after the GE news broke, a panel suggested $42 billion in new taxes – spread across higher gas and sales taxes plus new tolls — over the next 30 years. To put this into perspective, the state spends roughly that amount every two years. On everything. This is equivalent to increasing all taxes by roughly 7 percent. There’s a better way to pay for transportation. A number of important investments need to be made. But we need to think about them as priorities displacing other needs rather than additions to the shopping list. First, we need to set priorities within the projects we hope to fund. There is a proposal to spend $1 billion — give or take — on a railroad to Massachusetts for 2,200 commuters. 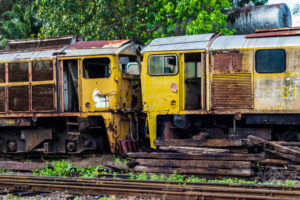 An existing rail line, you may have heard of this one, to New York City serves 125,000 people per day and it is looking for $3.9 billion in upgrades. Sure, we could do both. But if the choice is $1 billion in new taxes or a $1 billion rail line for 2,200 commuters (if you need help with the math, that’s $454,545 per rider), how hard do the 3.578 million of us who won’t be riding it need to consider it? Would some people in Connecticut be a little better off if we built a rail line to Springfield? Yes, but not $1 billion better. And the $1 billion is just to build the rail line. We will have to run trains on the line if we want 2,200 people to ride it each day. (This will lead to proclamations of 1 million rides a year because a typical commuter makes about 500 trips a year: twice a day for 250 weekdays.) The state subsidizes Metro-North riders about $2 per ride. Shore Line East costs the state about $40 per ride. Depending on which line the Springfield project more closely resembles, taxpayers will need to chip in somewhere between $2 million and $40 million to serve this small group of commuters. This is just one example. Once we prioritize all of our transportation projects, we can have a realistic idea of what we will actually need. Then we can prioritize across state government. This article first appeared in the Lakeville Journal.